The traveling exhibit entitled The Borscht Belt: Revisiting the Remains of America’s Jewish Vacationland opens on February 1, 2016 at the Madron Gallery in Chicago. The exhibition features 27 large-scale images complimented by a selection of original artifacts and ephemera from some of the Borscht Belt’s most beloved hotels and resorts. The exhibit, which documents the dramatic decline of the resorts of New York’s Catskills region, will be at Madron until the end of March. From the 1920s through the 1960s, the Catskill Mountains of New York were a popular vacation destination for millions of Americans. Known as the Borscht Belt, the region combined recreational activities with nighttime entertainment, especially stand-up comedy, which was born in the region’s theaters and showrooms. At its peak the Borscht Belt was comprised of over 500 hotels and 50,000 bungalows. 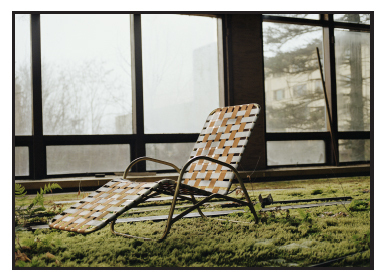 Photographer Marisa Scheinfeld, who grew up in the region, has been documenting the dramatic degradation of some of the most famous Borscht Belt hotels and colonies. The images reveal ghostly remnants of the glory years of the era, as well as powerful evidence of nature’s claim on the resorts and their landscapes, and new uses to which the spaces have been put in recent years. The Borscht Belt is a small area located in the southern tip of the Catskills that was once internationally known as a destination place offering its visitors entertainment and leisure activities. Predominantly a retreat for American Jews, the region is also notable as being the birthplace of stand-up comedy and its happenings largely influenced mainstream American culture. If you are unfamiliar with the term “Borscht Belt”- the film Dirty Dancing might elaborate on the subject matter. Driving through the landscape today, it is hard not to notice the leftovers of many of the Borscht Belt’s former hotels and bungalow colonies. As a photographer I felt inclined to do a project which documented its history and subsequent demise. This exhibition (and upcoming) book lends itself to a present-day view of the Borscht Belt abandoned spaces. While historical and personal, having visited some of these hotels herself as a child, Scheinfeld’s project is quite contemporary – existing as both commentary and elegy to the fallen era, residing at the intersection of culture, landscape and time. Entitled The Borscht Belt: Revisiting the Remains of America’s Jewish Vacationland, this traveling exhibition is presently touring the country. The exhibition was developed and commenced at Yeshiva University Museum at The Center for Jewish History in New York, traveled to The National Yiddish Book Center in Amherst, MA and is opening at Madron Gallery (in Chicago) on February 1 where it will remain until the end of March. Due out in the fall of 2016 is a book of this entire series published by Cornell University. The book will include introductory essays from Jewish American historian Jenna Weissman Joselit, writer Stefan Kanfer, and Marisa Scheinfeld along over 120 images. It will also include writings from notable Borscht Belt personalities such as Mel Brooks, Larry King, along with writer Alan Weisman, and artists/photographers Laurie Simmons and Mark Klett.